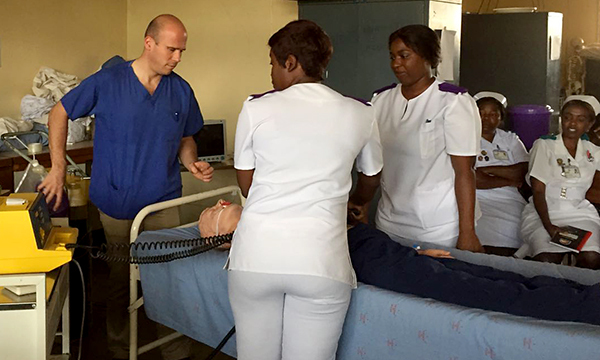 Since 2014, nurses and nursing students from the UK have been visiting Zambia and working with the Ministry of Health there to help develop critical care nursing. Here a group of students describe how their counterparts are trained in Zambia and find major differences from the UK system. of Healthcare Education, at a training session in Zambia. After our first week of working alongside our fellow student nurses in Zambia it has become apparent that there are major differences between our training and theirs. Our three-year degree level university course assesses classroom learning with examinations and assignments, while linking physiology with specific nursing case studies to promote patient-centred care. Practical skills are developed through practice placements with set outcomes in order that we can be signed off as clinically safe to continue on our professional development. It is a fifty-fifty split between academic and clinical. We have gathered from talking to other students that their learning is classroom-based and assessed through objective structured clinical examinations (OSCE) relating to specific nursing procedures such as medication administration and documentation. Their focus seems to be mainly on practical skills and the clinical aspect of nursing. They do not cover the physiological impact in as much depth as we do. It appears to be a very task-orientated approach to nursing. We have designated nursing mentors during our clinical placement and they are visited by their tutors on ward and are assessed on certain skills. Competence is established after just demonstrating that skill once, whereas we are continuously assessed over our three years in simulated scenarios and on the ward. Another big difference we have noticed is communication. During our course the importance of effective communication and documentation is constantly reinforced, as it can affect the care our patients receive. Poor communication leads to poor patient care. The students here do not seem to have a voice on the wards. We feel this is also true for the qualified nurses. They do not seem to act on simple things such as changes in the patient’s condition, which can be seen from the observation charts and fluid balance recordings, but await direction from the doctor as to what to do next. This can cause issues, as a variety of doctors seem to pass through the ward and change patient care plans regardless of previous professional input. To understand the student nurse training better while we are out here, we have spoken to the students’ clinical nurse tutors and asked to attend some of the classroom sessions to give us a better insight into how their training is structured over the four years that they are in training. We are all looking forward to seeing the differences between the training programmes and hope to learn and develop our reflections from this.